The Harwood Stripe Casual Shirt is unlike your average stripe. This shirt features a unique white and blue vertical stripe pattern, in which the blue warp threads are taken out of ‘work’ in the fabric, creating heathered looking striations. This lightweight style is constructed from 100% cotton, sourced from luxury mill, Albini. 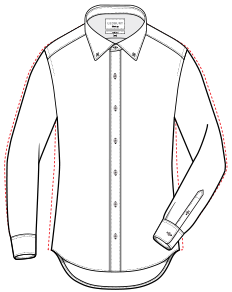 Finished with the Ledbury Spread collar and a regular body length. Available in classic and tailored fit.